In this guide, a music and creative arts therapist advises caregivers of aging parents. A former director of a senior center, Conroy (One Man’s Music, 2008) shares personal insights into the challenges associated with caring for elderly loved ones. Much of this short book focuses on the inevitable emotional baggage that exists between adult child and aging parent, demonstrating that truly understanding the relationship one has with one’s mother or father is the basis for compassionate caregiving. Conroy draws from her professional experiences as well as the trying interactions she had with her own father, lending an intimate slant to this instructional manual. She suggests that the caregiver needs to identify “Three Truths” (“your parent’s basic personality type,” “your relationship to your parent,” and “what your parent needs to feel validated and whole”) to be most effective. The author’s well-constructed description of the four “dysfunctional” parent personality types is likely to resonate with caregivers. Her strategies for dealing with these personalities are simple yet dramatic in their impact. She learned, for example, that her “dad’s passion was talking about himself,” something that “did not interest me, but I was willing to be bored, in order to please him.” Conroy explains the ingenious way she leveraged this factor to construct a situation in which both she and her father could be entertained. Not surprisingly, some of the techniques the author uses revolve around music, and it is a delight to read how this universal language brings joy to senior center residents. One of the more intriguing observations the author makes is that “compassionate lies” are not only acceptable, but also necessary. In the case of her father, Conroy lied to him about where she was getting the money to pay for his home attendants so he would accept the care. “I hated lying to my father,” writes Conroy, “but I had no alternative….This lie injured no one....It insured my father’s safety, and saved my sanity.” Conroy’s descriptive text is augmented by cartoon illustrations by her husband, Larry. 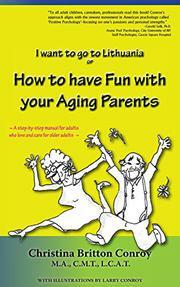 Sensitive and empathetic; offers excellent suggestions for coping with the harsh reality of caring for elderly parents. WHAT SHALL WE DO WITH MOM? "IT'S BECAUSE I LOVE YOU"